The Wild’s captain is moonlighting. 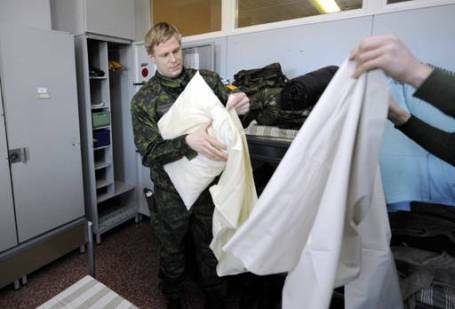 Mikko Koivu is trying to fulfill his six-month Finnish military obligation little snippets at a time. With the Wild out of the playoffs and with the world championships nine days from starting, Koivu signed up as a private in the Finnish Army Tuesday. I ran into Koivu last week. He left for home Sunday and told me about joining the Army. "It's the right thing to do," he said. Koivu joined the Lahti sports school, where several professional Finnish athletes have fulfilled their requirements. Speaking of Bruno, he's expected to be a guest playoff analyst Friday-Sunday on NHL Network's On the Fly. The Houston Aeros will be looking for the four-game sweep of Peoria tonight. No updates on the Wild coaching search. There's no rush. GM Chuck Fletcher wants to at least wait until the first round to end because other candidates may emerge, either through fired head coaches or assistant coaches that become available. He was in Houston last week watching the Aeros and made a quick jaunt over to Europe for a little scouting. One candidate of many could eventually be Atlanta associate coach John Torchetti. The Wild has a lot of respect for Torchetti. Assistant GM Brent Flahr ran San Antonio when Torchetti coached there. Fletcher has not yet asked permission to speak to Torchetti though. However, as I reported today, Florida has. Torchetti used to be a Panthers assistant and interim head coach, as well as Kings interim head coach. Florida GM Dale Tallon knows Torchetti well. Tallon was GM in Chicago while Torchetti was assistant coach there under Denis Savard and Joel Quenneville. Logan Couture, Jeff Skinner and Michael Grabner were named finalists for the Calder Trophy today. Wild contenders could be Pierre-Marc Bouchard or Brunette for the Lady Byng (announced Thursday) and Bouchard for the Masterton (announced April 26). According to sources, the Wild has agreed to terms with UMD Bulldogs star Justin Fontaine. One week after the Wild signed North Dakota defenseman Chay Genoway to a one-year deal, the Wild will bring Fontaine, 23, into the fold on a two-year deal. Fontaine, an All-WCHA Second-Teamer for three consecutive years and native of just outside Edmonton, scored 62 goals and 164 points in 159 games.